Located in the northwest of South America, Ecuador is one of the smallest countries in the continent. It is the perfect size for tour holidays as you can comfortably fit in all the sights. 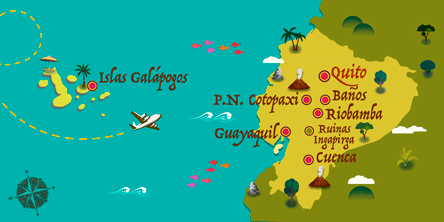 Bordered on the north by Colombia, south and east by Peru, and west by the Pacific Ocean, which bathes the entire coast, one of the most fertile regions which contain the country's natural jewels, the Galapagos Islands. In the interior lie the two Andean mountain ranges, whose highest summit is the Chimborazo, standing at 20,702 feet, and the Amazon rainforest can be found in the east. Ecuador's name refers to the equatorial line of the earth, which passes very close to the city of Quito and crosses the country from east to west. Ecuador's economy depends on oil, the forestry industry, fishing and agriculture as well as coffee, cocoa, palm oil, sugar cane and banana production, being the world's leading exporter of this fruit. During pre-Columbian times, a great variety of indigenous groups coexisted for thousands of years, before being first colonized by the Incas at the beginning of the 15th century and later in 1533 by the Spanish conquistadors. After bloody struggles, Ecuador achieved independence on May 24, 1822. During the first years, Ecuador was part of the Republic of the Great Colombia of Simon Bolivar, together with the current nations of Venezuela and Colombia which lasted until May 13, 1830. Ecuador is a multi-ethnic and multicultural nation. With more than 12.6 million inhabitants, 5.5 million live in the mountains, 6.5 on the coast, more than 600,000 in the Amazon and about 17,000 in the Galapagos. Ecuador is home to 14 indigenous nationalities who successfully preserve their traditions. Traveling to Ecuador is like experiencing 4 different worlds; the Andes, the Amazon, the Pacific coast and the Galapagos Islands and all of them are dotted with elegant cities inhabited by friendly people who seduce the visitor with their traditions, festivities and culinary skills. In short, it has a lot of potential, a rich cultural heritage and the greatest ethnic diversity and biodiversity per square mile, wonders that are very attractive for all types of travelers. Minimum of 6 months validity with one passport page. Consult your doctor for advice on suggested vaccinations and to discuss the effects of altitude sickness. From 22 July 2018, it will be mandatory for tourists to carry a valid health insurance policy. All the comments below belong to people who have travelled to Ecuador with Exoticca in the past 18 months. If Ecuador has caught your attention, leave us your number so we can call you to discuss the voyage that awaits you.